Belts: a waist of styling time? 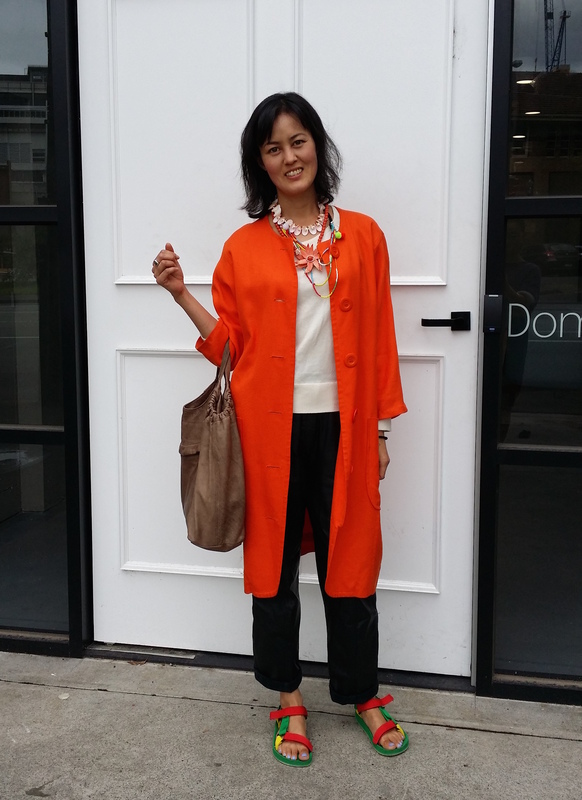 This orange coat is one of my favourite things ever and I often get complimented on it (probably just because not many people in Melbourne wear colours other than black, haha). It works as a lightweight coat – or add a belt/sash and it’s a dress. I did have to alter the length of the sleeves but that was the extent of my refashioning efforts. OK, so I did change a few things about this dress, namely adding a ruffle to the hem. But these before and after pics also show you how a shapeless 90s number can be transformed by putting a bit of focus on the waist. At a pinch, I really could have just tied a sash around the waist and have been done with it. This dress was actually a skirt before, so a bit of unpicking and a bit of sewing was definitely involved! 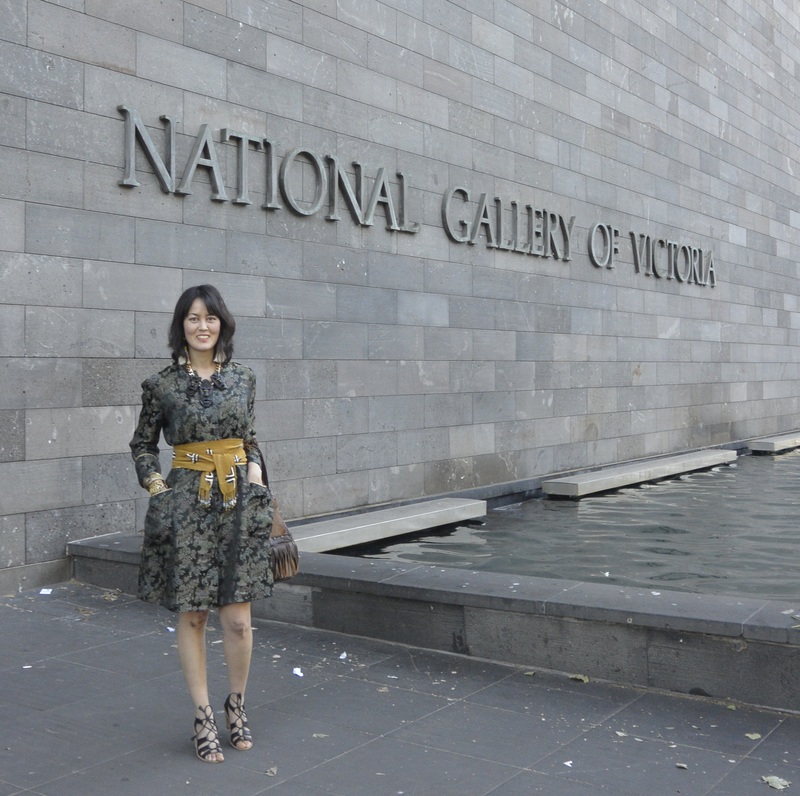 But it genuinely surprised me how different it looks belted when I wore it to VAMFF recently, mainly because I hiked it up around the waist so there’s a bit of blousing and the hem falls at more mini-length than on-the-knees. (Proud DIY-er moment: I got snapped in this dress for Vogue Australia’s Street Style! Scroll through to number 25 and you’ll see me running – insofar as possible in heels – to make it in time for one of the shows). Turning a slippery satin-y dressing gown-y thing into something wearable doesn’t fall into the “beginner upcycler” category, I admit. But if you find one of these Chinese jackets, grab it, even if it kind of seems shapeless. They’re great as lightweight coats and can work as dresses too, nipped in with a belt or sash – witness the below. Having looked at these, I’m thinking maybe my advice to would-be upcyclers should be “carry a belt or sash with you when opshopping”! If you have trouble visualising whether a too-big or otherwise shapeless garment will work on you with some alterations, get into the change rooms and try belting it – it might turn out that no pins, sewing, cutting or otherwise fiddling about is required. What we really need is a wardrobe full of belts, with a couple of dresses we can put underneath them! It’s fun to see how a simple belt can change a garment into something with more panache.